Despite the immaturity, we evaluated nine and were impressed with Jive Software and Telligent Systems who lead the pack because of their strong administrative and platform features and solution offerings….we applied over 60% of our weighted criteria based on what our clients tell us they want, a solutions partner that delivers strategy, education, services, community management, analytics and support. The customer “wants” of strategy, education and services make sense, but they concern me and it’s important to unpack them further.Â Here’s why: those are typically agency and professional services attributes. If you speak with veteran entrepreneurs across technology and professional services, one thing is clear: a company CANNOT SIMULTANEOUSLY BE a product-technology company and a professional services company. You have to be primarily one or the other because there’s a conflict of agenda. The agency mindset is to deliver highly customized solutions for individual customers. But too often long-term product innovations and investments suffer because the model is biased to reward the customized services versus a better, scalable product. There are some hybrids, but they are rare. Many of the most successful technology companies are, in fact, agencies — once you look under the hood or into the books. At my company, we selected Telligent precisely because it was a proven, robust workhorse, powering many of the highest trafficked communities. But we also selected Telligent because it was a product company — NOT an agency with proprietary technologies that form the root of a consulting shop. For us, Telligent was the platform that seemed most likely to work out of the box, scale, iterate and improve according to customer feedback, and stay in business. Many an entrepreneur has realized this community opportunity, when I started to cover this market there were 8 vendors on my list, today the space now boasts 100 vendors and it continues to grow. I believe this Forrester Wave report will not only drive discussion of the enterprise community platform market, but will accelerate the inevitable classification of winners, losers, agencies, and pure product companies — not to mention those consolidations. But Telligent is not perfect. I wish Telligent would figure out a way to broaden and open-source it’s developer and app community the way WordPress blog platform has. Hey Telligent, if you’re listening, try to be more like WordPress! You’re stable and scalable, but we need faster innovation and more plug-in and play capabilities. Hopefully that recent $20 million cash infusion from Intel Capital will help. If anything, it will ensure their existence over the next few economically challenging years. Max, thanks for the context here – very insightful. Will be interesting to see which players in this space survive/thrive over the next 6-12 mos. standards and collectively iterated. Hence my comment about WordPress. Yes, Max, we're definitely listening. 🙂 Thank you for your affirmation that Telligent is truly a platform vendor and your feedback re: open source. 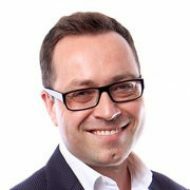 As Telligent's Director of Platform Strategy, I am responsible for keeping the company on track as an industry leader in having the most robust and extensible platform. And I fully appreciate that in today's competitive landscape, no software platform can be strategically viable without a vibrant community of developers and a diverse ecosystem of solution provider partners. We have some exciting plans for 2009, but I'm not quite ready to provide details just yet. Please don't hesitate to ping me with any questions or ideas. great article Max, thanks for the love! as Lawrence alluded to, 2009 will be exciting… stay tuned. Yes, it's possible to integrate Disqus or other 3rd party commenting systems (like JS-Kit) into Community Server. Ping me at LLiu[at]Telligent.com, and I'll get you connected w/ the right people to help. Max makes some good points, but allow me to counter his “technology vs. services” argument with one word, “IBM”. IBM is without question one of (if not the most) successful services and technology companies in the world. It's success is directly a function of it's blend of these two. And not just in big old mainframes, or PCs. IBM specifically took aim at and won the web site software wars, by emphasizing premiere services, supported by robust, technology (sometimes leading edge, sometimes mundane). There are other examples too, large and small, but IBM is especially relevant to this discussion as it has clearly stated its intention to win the social network software and services war too, by following its same services supported by technology blended strategy. So while we 9 companies designated by Forrester as the top of the industry argue and compete with each other, let's not miss the great services-technology blended bear coming down the path behind us. Max's point about focus is well taken. Indeed, for decades businesses have struggled with focus under the mantel of “What businesses are we in?” But in the 21st century Internet age of fluid customer needs and a constantly changing landscape of value add, the question moves to 'What businesses are we in and how do we fluidly manage across them?….. often integrating multiple parts from multiple partners with the partner in chief being our customers. In the social network industry we have a wide landscape ranging from platform only players to hybrid services/platform companies, to services only. All 9 companies in the Forrester Wave provided platforms. In the services spectrum, some have virtually none, some quite a bit Note that the Wave chart's horizontal axis “Strategy” does not refer to services capability, but rather the vendor's articulated company strategy and market presence. One would have to delve into the report itself to see which vendors are ranked high or low on services (strategy assistance, community management, moderation, etc.). Why is this the case? Because as with all technology (mainframes, personal computing, web site, social networking), it's not the whiz bang nature of the technology that solves business problems, but what you do with it. More so with social networking which is not simply an application, or an application category. It is an entire sea change in society of how we live, work, learn and play. Everything is about relationships. The ambiance, the culture, the way a company participates and integrates with that web of relationships defines the results. In fact it is reasonable to say that a company that excels at the culture and management of the social network, even if it is using the most mundane software will do better than a weak process/roles/culture/management approach with the most innovative software. Hybrid vs. just services or technology. Ultimately the customer is best served and in fact only served by by a hybrid solution. They must have both services and technology to succeed. The question is how to they get to that end result? A platform with no services is missing what Forrester states is 80% of the solution. Even though the technology is only 20%, without some kind of software there is no solution. Some clients go with a platform only vendor or a services only vendor, using a 3rd party to deliver the other element. Others will attempt to build the software themselves or rollup the services need internally or both (Such home grown approaches are not recommended. Really, this is a very specialized area for both services and technology. Home grown is asking for a disaster.) Still other clients will go to a hybrid vendor that is able to blend both services and technology. Each has its place. A platform only vendor will often, but not always have the latest software features. A services only vendor will tout technology objectivity and put 100% of their effort into planning and management. The benefits of the hybrid vendor are 1) One stop shopping (which can very important to top brands) 2) More attention to the complete integrated solution and 3) The services and technology inform each other yielding aspects of the solution unavailable elsewhere. At LiveWorld, there are many features we have built into our platform driven by our services insights. A specific example is moderation. LiveWorld is considered a leader at moderation services having delivered over 1 million hours of moderation across our own platforms and quite a few other platforms in the industry. That experience has enabled us to develop more advanced moderation tools, so much so that we now make the tools and services available together to moderate other application platforms. We simply could not have developed that technology without the benefit of hundreds of moderators and hundreds of thousands of moderation hours for insight. That isn't to say it's easy. The hybrid approach is more complicated for a company to deliver, so a client must be choosy. But they should be choosy if picking a platform only or services only vendor too. A vendor can be successful anywhere along the spectrum because the market place has a wide range of needs. For whatever position the vendor chooses they must execute their model well and be very flexible. The strongest argument for a hybrid vendor is that while technology ebbs and flows, services delivery comes with a deeper learning/experience curve. On any day of the week, any one of the provider's technology might be better than the others, at least on some dimensions. A week later that could reverse. Hybrid firms like IBM that prioritize services, supported by a technology blend, just keep moving forward at solving client problems with full solution thinking. The technology ebbs and flows, informing the services that just keep marching on. and far more a services company everyday? analytics, etc. In some cases, a best hybrid. Hi Max and thanks for the good words. One would think that a vendor in slot #1 being totally invested in it, and not having to be flexible would lead the innovation curve, followed by #2 and so on. But per my comments above. it ebbs and flows among them all, driven often by the practical circumstances of each vendor. The added capabilities of scenario 2 are so important though that the resulting flexibility probably outweighs any innovation from scenario 1. Depending on the client, that may be true for 3 over 2 and 4 over 3…or not. 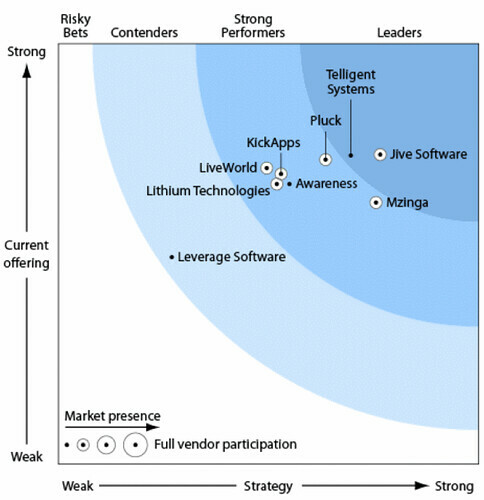 Most of the Forrester top 9 vendors are in slot 2 or slot 3. Theoretically one day we'd have open standard, open source , do it all, unlimited flexibility social network platforms (one all encompassing one, or a few with interoperability). While LiveWorld writes much of our own code, it's all standards (Java shop). We actually use some other vendor platform code in some cases, and open source as well. We even considered and had high hopes for Drupal for a while. Now there is a very interesting platform with an entire eco-system of 1,000's of developers contributing to its evolution. Alas we found it slow to develop on (so there goes the platform leverage in a practical sense) with scale issues. Just wouldn't work for our larger client deployments. More suitable to shorter term projects with low scale systems. Missing many things our clients ask for, though having quite a few we have yet to see in any of the top 9 company platforms. So I agree with you conceptually, but find that client needs and platform realities tend not to adhere to the concept 🙂 And all of that is apart from the strategy/.community mgmt/moderation services part o the equation. Thanks for your thoughtful response — I learned a lot. I think a key lens is sophistication and complexity of the problem — and the more of that, the more relevant your individual approach is. In contrast, I would think a company with more straightforward needs would quickly go for the best product, most simple and beautiful, scalable, instant, with as few extraneous features as possible. At this time, my start-up company would fall into that camp. So here u r coming to say that it is an entire sea change in society of how we live, work, learn and play. Everything is about relationships. Ah at last! I needed something like this to finish my Uni report! Thanks, it's quite detailed. Please put web 2 platform, This can be also help your online promotional strategy. Japanese Knotweed There are various different methods of Japanese knotweed removal. Using a Japanese knotweed rhizome barrier may be one of the methods to prevent the local spread of the plant. This will prevent the spreading across a land boundary as the barrier is buried along the required margin. The barrier is comprised of a thick sheet of plastic that cannot be penetrated by underground growth of the knotweed. At Accidents Direct we recognise that being injured or involved in an accident can be stressful. It is therefore very important to be only in the best hands. We work with a network of specialists injury lawyers around the country, who deal with all claimants to a very high standard of personal service and attention. Simply fill in our claim form and one of our claim executives will be able to asses in minutes if they think our specialists injury lawyers maybe able to help you, and offer to send your details through to a lawyer. Hello, if you are searching any job so please visit http://www.staffingpower.com there are many jobs available. Great article.Interesting to read “Community Platform Conundrum: Agency Versus Pure Product”.Amazing job.